Scooper - Technology News: Which are Africa's most competitive countries? 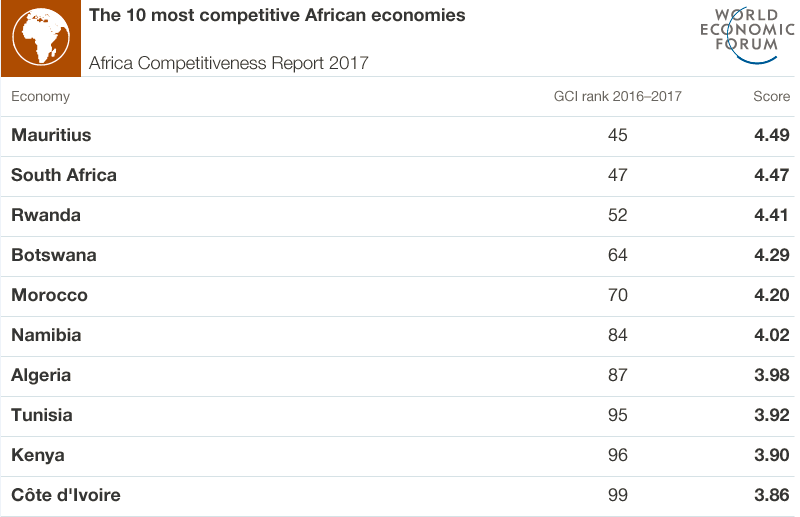 Which are Africa's most competitive countries? Africa is full of brilliant, educated young people. Troublingly full. 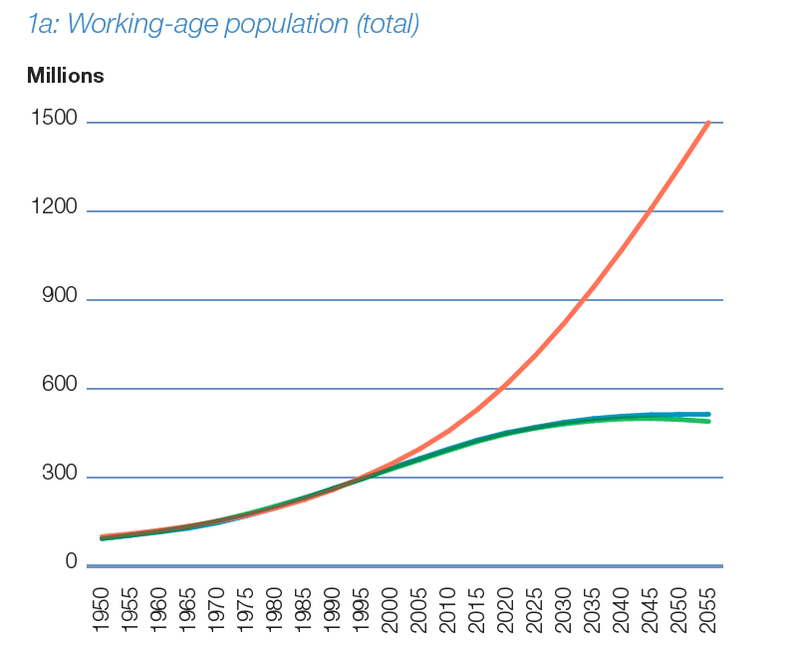 The number of working-age people in the continent is expected to grow to 450 million over the next couple of decades. But Africa's engines of job creation aren't keeping up. If enough new positions aren't created by 2035, Africa may be sailing towards a crisis of youth unemployment. According to the Africa Competitiveness Report 2017 , published today, African leaders have a choice. They can either put into effect structural reforms that improve people's livelihoods or allow current, not-quite-adequate constitutional policies to unravel towards inequality and civil unrest. The chart below, taken from the report, shows the rise in the number of working-age Africans since the 1950s, with the soaring red line plotting the expected rise in sub-Saharan numbers over the next 30 years. It's a dramatic demographic forecast. But what can Africa do to avoid it turning into disaster? Progress at raising competitiveness and productivity has been slow – yet without those two desirable traits, economies will struggle to provide more employment opportunities. In fact, unless current policies change, there’ll only be a quarter of the required jobs by 2035. The solution may lie in competitiveness, in pushing forward structural reforms that boost productivity, create jobs and determine how prosperous a country can become. This can be anything from affordable housing to clean water, better transport and sharper training initiatives – anything that helps people learn and connect and thrive. So which countries are getting it right? Below is a list of the 10 best-performing African nations, as measured by the World Economic Forum's annual Global Competitiveness Report. Mauritius, South Africa and Rwanda come out on top. First, a little perspective: although Mauritius ranks first among African countries, it is still only at No 45 in the global index, a sober nod towards Africa’s slowing productivity levels after a decade of sustained growth. If Mauritius consistently outperforms its continental peers, it’s because its leaders have removed the hurdles that prevent so many other countries from achieving prosperity; in this case, streamlining its goods market, building solid infrastructure and promoting a healthy workforce. South Africa and Rwanda also do well and have improved their global ranking since the last index was released in 2015. Their continued growth can be attributed to the uptake of technology, efficient financial markets and a focus on strengthening institutions. These are just some of the factors that contribute to a country’s prosperity. But the most important are those that enable people to find employment, travel to work and carry out their jobs. If they can do that, then disaster is not only averted, it is turned inside out, into an economic revival that may yet sweep Africa to prosperity.